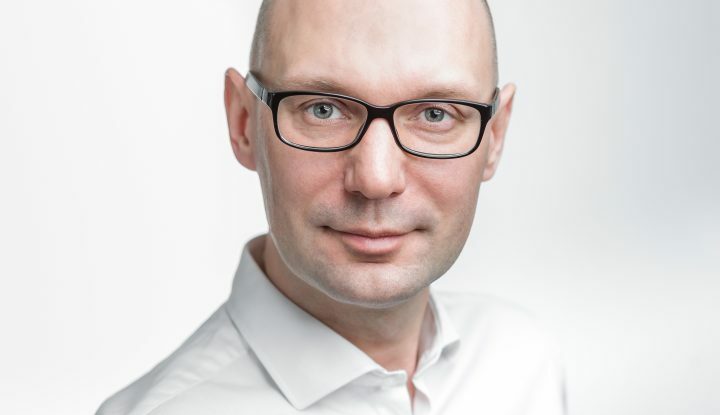 2018 was a year of challenges in Sabre Poland. We continued and developed projects from previous years, and also created new ones. In last year our employees were engaged in more than 80 conferences, events, and activities. 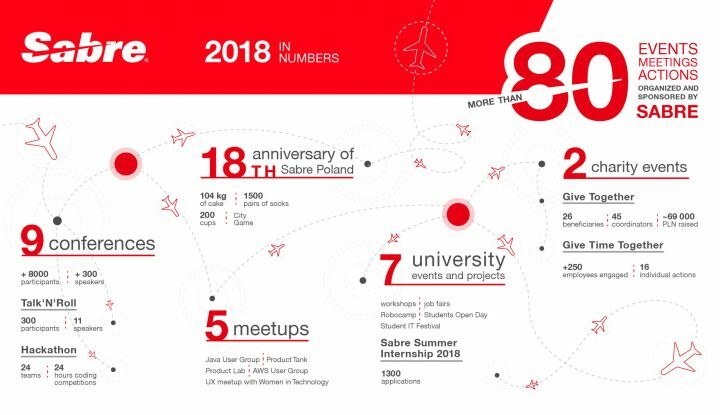 In 2018 we celebrated the 18th anniversary of Sabre Poland. We arranged many activities related to our birthday and the City Game was one of them. Over 100 participants solved our puzzle, which was hidden on city posters. And there were, of course, 18 winners. Except that, we had special gifts – 1500 pairs of socks, 200 cups and 104 kg of cake. All these conferences gathered more than 8000 participants and 300 speakers from all over the world! Beside sponsoring, participating and supporting conferences we also create our own one. The fourth edition of the Talk’N’Roll was the second open to the general public. Interest in the event far exceeded our expectations again. 300 participants took part in TNR 2018 and listened to 11 speeches. Want to know more about Talk’N’Roll? Read our report from the event and watch speeches on YouTube channel. 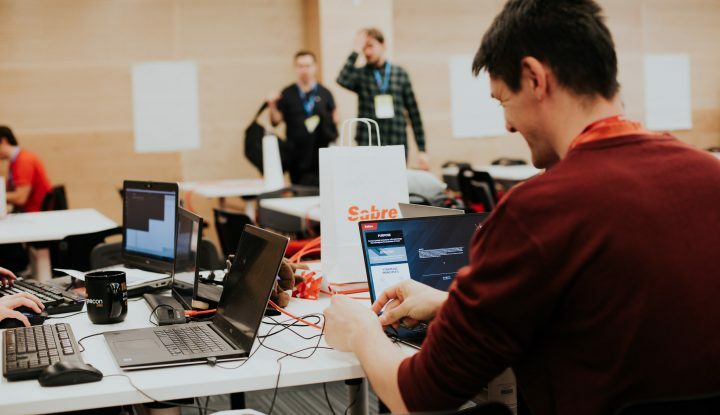 Reimagine the travel was the main topic of Sabre Krakow Hackathon, which took place on 17-18 October. Rules were simple: 24 teams had 24 hours to develop an idea, collaborate with cross-functional, and cross-business unit teams of developers, product managers, business analysts, and UX professional to solve a travel-related problem. And the winner was an amazing Red Team. Meetups are our way to learn, share ideas and meet interesting people. Each of them gathers several dozen participants, not only from Sabre. 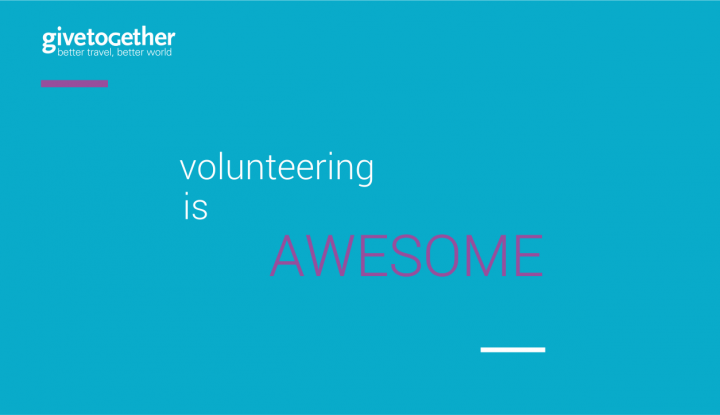 Give Together and Give Time Together are the two most important and biggest global charity events in Sabre. The main idea of Give Together is based on organizing fun and creative fundraising events by employees, as a way of raising money for local charities. In 2018 we organized many actions: food and book sales, online auctions, sports, and computer games tournaments, Short Movie Festival and many more. We collected near 69 thousand PLN and we helped our 26 beneficiaries. Give Time Together has a different aim – instead of raising the money we spend our own time to help others. Thanks to their initiative, over 250 Sabre employees were engaged in 16 different activities like cleaning Gorce Mountains, gardening, painting, and cleanup works in Harbutowice shelter or work in the storehouse at Kokotów. All these activities and events were possible only thanks to the initiative of our employees. They, with the support of the company, implemented their ideas and created amazing things, developing themselves and helping others.